Lurkville Skateoards has been making decks with a style from the early 60s, Russ Meyer films, hotrod culture since the get go. 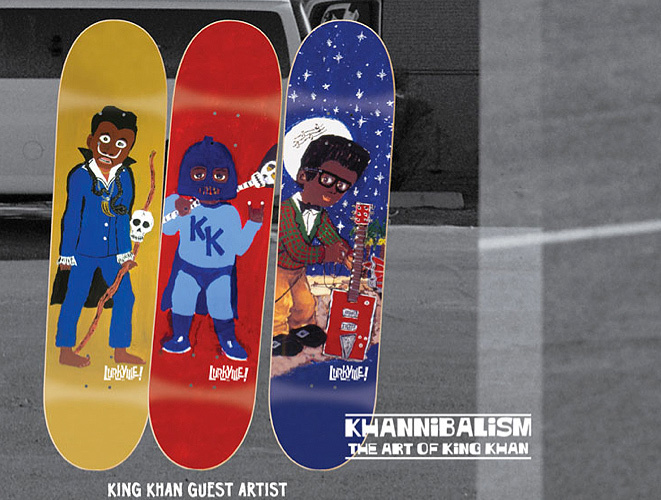 These three decks in the Khannibalism series are from guest artist and international retro-rock super star, King Khan! This series makes me think of a voodoo-trinity. Bo Diddley (blue deck on the right) representing the sound, Screamin’ Jay Hawkins the swampy-spirit (yellow on the left and Mr. Fakie’s favorite), on the center red deck the son of psychedelic soul King Khan!